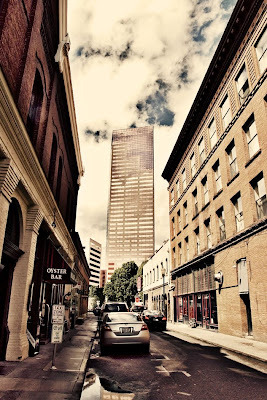 For those of you who don't know, "old town" is a historic neighborhood in downtown Portland. I took this while on a shoot for a client. And no it was not portrait work. The lady who started Saturday Market back in 1974 wanted me to photograph the new site for the market, yes Saturday Market is not in Skidmore/under the Burnside Bridge anymore. It has moved across the street into waterfront park. I personally like the change. So Jannette Spencer (the founder of the market) is making a book and wanted me to take photos for it, of the new site. Busy weekend; I worked over 12 hours on Saturday both doing this and working with my dad doing sound for an auction. very interesting shot...the streets look very narrow...are they? Yeah Tim, what'd you do to the streets!? ;) Seriously, they do look pretty narrow. Congrats on landing that job! Remember, out of all the architectural photographers in Portland, a city of 600,000, she went with you! yeah this was a really narrow side street. It was in between two rather large(r) streets.